Given the current political forces in Baghdad and security realities in Mosul, an incremental approach is needed. An Iraqi police man walks towards the remains of the Al-Nuri mosque, where the Islamic State caliphate was proclaimed, in the old city of Mosul, Iraq, 21 September 2017. 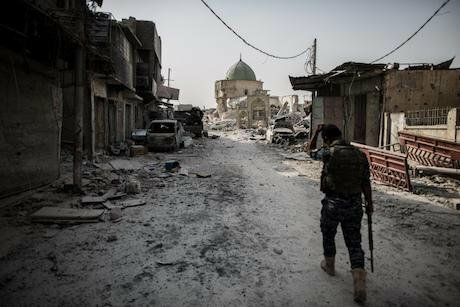 After almost nine months of heavy fighting Mosul was declared liberated from the so-called Islamic State in July 2017 leaving its western part mostly reduced to rubble and inhabitable. Oliver Weiken/DPA/Press Association Images. All rights reserved.Nearly a year on from legislation to integrate the Popular Mobilization Forces (PMF, or al-Hashd al-Shaabi) into the Iraqi security apparatus, they now constitute half of the security forces nominally under governmental control. The predominantly Shia PMF were once the most important players in preventing the ISIS advance of 2014 on Baghdad and played a widely acknowledged role in subsequent efforts to liberate ISIS-controlled areas. Yet, as the threat of ISIS recedes and stabilization becomes the number one priority in Iraq, political disputes over the future of the PMF are intensifying in Baghdad and reverberating throughout the country. The reasons for the dispute lie with concerns about the true loyalties of those that command the PMF. Those concerns centre on enduring sectarian loyalties that may trump the national effort to rebuild the country for all its citizens. The PMF debate is particularly striking in Mosul. Efforts to rebuild security here have drawn a significant amount of international interest. For Iraqi and coalition security professionals, Mosul is seen as a ‘canary in the mineshaft’ for the success of on-going efforts to defeat ISIS and create stability in Iraq more broadly. As one of the conflict epicentres and a majority Sunni province, the security situation in Mosul today is exceedingly fragile and exacerbated by the presence of sectarian-oriented Shia PMF elements. Beyond the obvious sectarian tensions that dominate the discourse around the PMF, the presence of these groups constitute subtler but perhaps even more profound challenges. Iraqi and US commanders see things similarly but through different lenses. From the US perspective, one of the biggest challenges to providing security and stability is the necessity to achieve unity of command. During the clearance of Mosul, the unlikely coalition of PMF, Kurdish Peshmerga, western Coalition forces, and other Iraqi security forces merged around the ouster of ISIS. With ISIS militarily defeated, the more complicated stabilization efforts are suffering from a lack of coordination between units contributing to the ‘hold’ mission in Mosul. Hold responsibilities, which include operating checkpoints, targeting suspected ISIS sleeper cells, investigating criminal networks, and detaining criminals, now fall to a motley crew of subsidiary organizations. The political fault lines that emanate from their parent ministries in Baghdad determine their loyalties. The PMF is believed to be heavily influenced by the Ministry of the Interior (MoI), which is dominated by the pro-Iranian Badr Organization. MoI organizations, in turn, have proven unwilling to cooperate with security forces operating under the Ministry of Defence. To complicate matters further, it is widely recognized that there are deep political and ideological fissures between groups within the PMF, with individual groups loyal to various (and often opposing) political and clerical leaders and seeking different political dispensations in a post-ISIS Iraq. Operationally speaking, this means that coordination among and between PMF units and adjacent security organizations is difficult and in places, non-existent. For these reasons, and despite a task organization that places PMF units in Mosul nominally under Iraqi army control, some senior security leaders have indicated that they have little influence in how or where they operate, and the spectre of malign Iranian influence weighs heavily. Iraqi security leaders in Mosul see a separate but related issue as their main concern in the post-ISIS stabilization effort. In an interview, Major General Najim al-Juburi, the commanding general of the Ninewah Operations Command (NOC), strongly asserted that the most important factor in preventing Mosul from becoming a safe-haven once again for takfiri-jihadism is to ensure there is a good relationship between the security forces and the local population. Towards this end, among senior Ninewah political and security leaders today there is a desire to move quickly towards community-based policing and the removal of non-local and militarized security elements from Mosul proper. This includes relocating the Iraqi Army outside of the city limits. The recent allegations of war crimes being committed by the 16th Iraqi Army Division are an apt example of the strategic risk inherent in a prolonged militarized presence in civil society. This is a risk that Najim is well aware of and wishes to mitigate by removing both the Iraqi Army and the PMF from city centres throughout Ninewah Province. The risk of alienating the local population and recreating the grievance-laden breeding ground for ISIS resurgence is amplified by the presence of the PMF in population centres. There is broad consensus that the PMF are regarded as outsiders. Much of this consensus emanates from increasing reports of kidnapping for ransom, illegal seizure of property, and other forms of harassment allegedly perpetrated by some PMF units. Some local sources even spoke of fears of the PMF repopulating Mosul – moving themselves, their families and their friends from outside the area into abandoned properties – in order to alter the demographic balance of the city. The PMF are nevertheless operating under the auspices of the Government of Iraq. To most locals, the security forces operating within the city are the most tangible manifestation of the state, and such abuses – by both IA and PMF units – confirm the ISIS narrative that the Government of Iraq is a sectarian puppet of Iran. PMF units are negatively impacting efforts to secure the population and stabilize Mosul. Their official connection to the Iraqi state, their overt sectarian bent, and their increasing criminality all do lasting harm to the legitimacy of the Government of Iraq with local Maslawis. Myriad challenges to stabilizing Mosul will remain for years, but completely removing the PMF variable from the security equation would increase the likelihood that the Government of Iraq will be able to consolidate the gains made in its anti-ISIS campaign. Ultimately, PMF units comprised of non-locals should be removed from Ninewah Province, and local Sunni units (referred to as Tribal Mobilization Forces, or TMF) should be disbanded and their personnel absorbed into local police forces or other public service apparatuses. Given the current political forces in Baghdad and security realities in Mosul, however, an incremental approach is needed – and likely, all that is possible at the moment. The decision to remove the PMF from Mosul will be dictated by decisions from Baghdad. The US-led coalition could contribute first by continuing to provide unwavering support to Prime Minister Abadi, giving him a visible and enduring commitment of military advisors, material support, and access to resources for capacity building and reconstruction efforts. The recent Kurdish independence referendum and resultant re-taking of Kirkuk by Iraqi Security Forces have significantly complicated the United States’ political position in Baghdad, but efforts should be made to separate these Kurd-Arab ethno-political challenges from efforts to prevent an ISIS resurgence in the Sunni heartlands of Iraq. Secondly, back in Mosul, coalition advisors should continue to engage with political and security leaders to enhance their ability to understand their operational environment and synchronize operations between organizations especially as it relates to the different ‘hold’ missions in the east and west of the city. More specifically, the US-led coalition should support Iraqi Security Forces as they try to mitigate criminal and sectarian PMF activities by conducting joint coalition-Iraqi patrols throughout Mosul focusing on PMF-held sectors. This support should be conditional, however, upon legal and ethical behaviour by the Iraqi Security Forces, and the US should credibly signal that this support will be withdrawn if allegations of war crimes continue to surface. If and when PMF units begin to withdraw from Mosul, a more granular understanding of the security gaps they would be leaving behind would facilitate a quicker reorganization of security forces and mitigate opportunities for ISIS regeneration. Finally, coalition advisors should capitalize on opportunities to verbally back Iraqi security leaders in meetings that focus on PMF malfeasance, particularly meetings with PMF leaders present. Together, these practices would help to shape the security environment in Mosul by demonstrating to PMF units that they cannot act with impunity, and would embolden Iraqi Security Forces to counter illicit and sectarian PMF activity while simultaneously enhancing their operational capacity to stabilize Mosul.